Discover the hotel with the best Health and Leisure facilities in North Devon. Stylish Brasserie serving Breakfast, Lunch and Dinner. Choice of two bars, one by the attractive indoor swimming pool, offering relaxed dining. Room service, breakfast in room and packed lunches available. 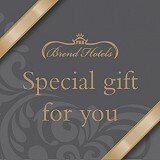 As our guest, you qualify for exclusive benefits at our other Brend Hotels and Restaurants here in Barnstaple. These include free use of top class leisure facilities and special guest discounts on luxury dining, drinks and cocktails. Find out more about our Barnstaple Collection here. Barnstaple Hotel vouchers, our special gift for you. We currently hold four stars on Trip Advisor for The Barnstaple Hotel and Brend Hotels are holders of the accolade for AA Hotel Group of the Year 2015-16.